This two bedroom villa, named 'Villa Vert', is peacefully located amidst Languedoc-Roussillon's pretty countryside and enjoys lovely, panoramic views of the surrounding scenery. 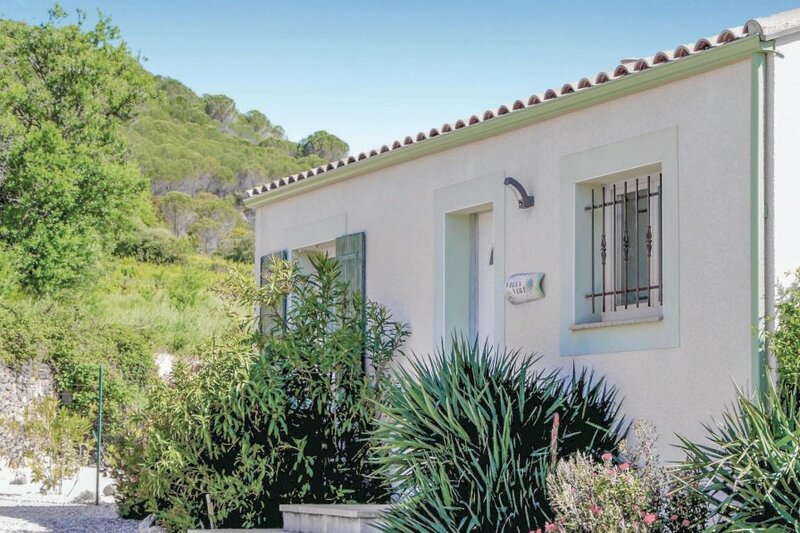 This two bedroom villa, named 'Villa Vert', is peacefully located amidst Languedoc-Roussillon's pretty countryside and enjoys lovely, panoramic views of the surrounding scenery. It offers a simple yet tasteful décor and is well-equipped with air conditioning and a selection of modern amenities. The holiday home boasts a private, outdoor and above-ground swimming pool (3.5m x 5m, depth of 1.2m) and small terrace area. The holiday home is within an hour's drive of a range of interesting sights and excursions: there are a variety of Cathar castles nearby, with the closest being Château d'Aguillar, which you can see in the distance from the property. You may also wish to visit the enchanting and sun-drenched towns of Narbonne, Perpignan and Carcassonne or laze on the endless miles of golden, sandy beaches. The nearest shop, café/bar and restaurant is 400m away. The nearest beach is 50km away. This beautiful modern villa is made from brick or stone and was recently built in 2010. The agent has rated it as a four star property so it is a well-equipped villa with above average furnishings. It is also great value for money. This villa has a swimming pool and view over the landscape; it is also located in Tuchan. It is set in a good location: there is a restaurant only 400 metres away.